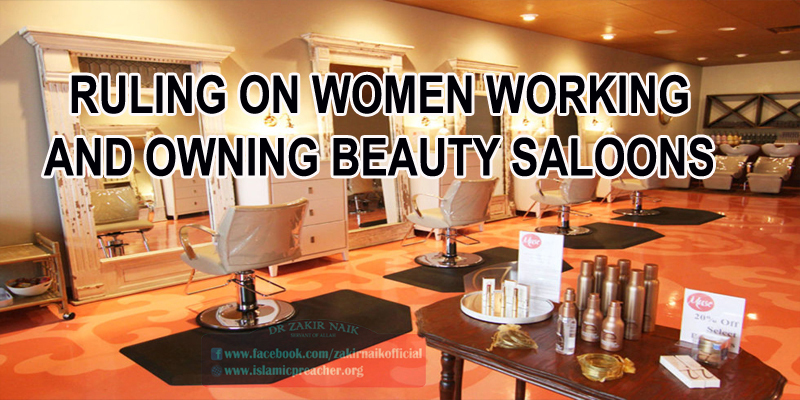 Some women go to women’s salons where there is a woman’s hairdresser, and this hairdresser shaves the unwanted hair of other women, even the hair of the most private ‘awrah, especially before her wedding night. The hairdresser also plucks the facial hair, and adds hair extensions for those who want that. What is the ruling on this work? Please advise us and explain the ruling to us, may Allaah reward you. Plucking means removing the hair of the eyebrows. Hair extensions means adding hair to the hair on the head. Both of them are major sins; the Prophet (peace and blessings of Allaah be upon him) cursed the one who does them or who does one of them. It is not permissible to uncover the ‘awrah before anyone except the husband. Allaah says (interpretation of the meaning): “And those who guard their chastity (i.e. private parts, from illegal sexual acts)” [al-Mu’minoon 23:5]. Part of guarding one’s chastity is the obligation to cover the ‘awrah and the prohibition on looking at it, except for the one to whom Allaah has permitted that, or in cases of necessity such as medical treatment which cannot be administered except by uncovering it for that purpose. Shaykh ‘Abd al-‘Azeez ibn Baaz, Shaykh ‘Abd al-‘Azeez Aal al-Shaykh, Shaykh ‘Abd-Allaah ibn Ghadyaan, Shaykh Saalih al-Fawzaan, Shaykh Bakr Abu Zaid. It is not permissible to use artificial nails, false eyelashes and coloured contact lenses, because it is harmful to the part of the body where they are used and because it also involves deceit and trickery, and is changing the creation of Allaah. Shaykh ‘Abd al-‘Azeez Aal al-Shaykh, Shaykh ‘Abd-Allaah ibn Ghadyaan, Shaykh Saalih al-Fawzaan, Shaykh Bakr Abu Zaid. There is no reason why a woman should not adorn herself by putting makeup on her face and kohl, and fixing her hair, in ways that do not resemble kaafir women. It is also stipulated that she should cover her face before men who are not her mahrams. The basic principle is that it is not permissible for a woman to wear perfume that has a fragrant smell if she wants to go out of her house, whether she is going out to the mosque, or elsewhere, because of the general meaning of the words of the Prophet (peace and blessings of Allaah be upon him): “Any woman who puts on perfume and goes out and passes by people so that they can smell her fragrance is a zaaniyah (adulteress) and every eye is zaaniyah (because it looks at haraam things).” Narrated by Ahmad, al-Nasaa’i and al-Haakim from the hadeeth of Abu Moosa (may Allaah be pleased with him). If the beauty salons are free of these things that are contrary to sharee’ah, then it is permissible to own them, or work in them. Otherwise it is haraam to own them or rent them or rent them out, and it is haraam to work in them.